“It’s not enough being talented, these days you need cash.” Steve Coogan’s observation is all too true in Britain’s film, television and theatre world. When Tom Watson, Labour’s deputy leader and shadow culture secretary, asked Tracy Brabin and me to lead an inquiry into access and diversity in the performing arts earlier this year, it was in response to the growing concern about the inequalities in the cultural sector and anger at the class ceiling that people from less well-off backgrounds found themselves hitting. Both Tracy and I worked in TV before going into politics – she as an actor, I as a broadcast journalist. As women from northern working class backgrounds we felt first-hand the problems with access and diversity, and what it’s like to have people sneer at your accent and struggle to pay your way. Some might say that the problems of exclusivity and privilege exist in every profession – that networks and connections are present in all industries. But it matters for an additional reason in this industry. Who we see on stage and screen, what stories are being told and where they are set impacts the way we see ourselves and how the world sees us too. They are a mirror to the nation and have the power to bring us together. But at the moment they’re not. Recent research by academics at LSE and the University of Edinburgh found that despite 33 per cent of the country coming from working class backgrounds, just 16 per cent of actors identified as working class, whereas 51 per cent identify as coming from a privileged background. The Sutton Trust found last year that 42 per cent of British BAFTA-winners attended a fee-paying school, despite just seven per cent of kids attending one. A report for UK theatre found that just seven per cent of the theatre and performing arts workforce were from BAME backgrounds and just five per cent identified as disabled. However you look at it, huge chunks of our society are not being properly represented in this industry, whether on stage or screen. Our report has produced recommendations to do something about it. The problems start at school, with the systematic marginalisation of arts subjects that means kids from underprivileged backgrounds don’t even know drama or working in the performing arts is an option. You can’t climb the ladder if you don’t even know the ladder’s there. Drama schools awarding degrees need to reform too. It’s ridiculous that some drama schools charge a fee of £100 just to audition, that’s on top of train fares and accommodation. If you want to apply to multiple schools to give yourself a better chance that’s hundreds of pounds before you’ve even got through the first round. When university interviews are free – even at places like Oxford where applicants are often housed and fed for free for multiple days – these audition fees are not justifiable. Poverty pay is another issue. The chronic problem of very low paid work means that you can only survive as a young actor or director or writer if you do other jobs on the side. The difficulty of this life means all but the most well off are being forced out of the industry. Some might say that’s the price for following your dream, but it shouldn’t be. Theatres are paying actors way below the minimum wage and it’s the government’s business to weigh in and stop that – we need an HMRC review of potentially illegal low pay practices. If you’re looking at diversity on stage, then you’ve got to look behind the scenes. We heard from BAME actors about the “exotic best friend” ceiling they kept finding themselves hitting – being offered stereotyped supporting parts, but rarely lead roles. Working class actors too found themselves offered the feisty barmaid over and over again but never Shakespeare. Until we have more diverse producers, casting directors, writers and commissioners behind the scenes we won’t see more diverse casts and stories on stage. Class ceilings are tough to smash but it is the responsibility of everyone in the industry to try. It’s time we brought the curtain down on white middle class dominance in the performing arts. We hope this report could help to do so. 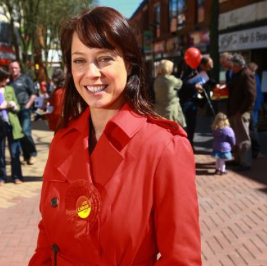 Gloria de Piero is MP for Ashfield.